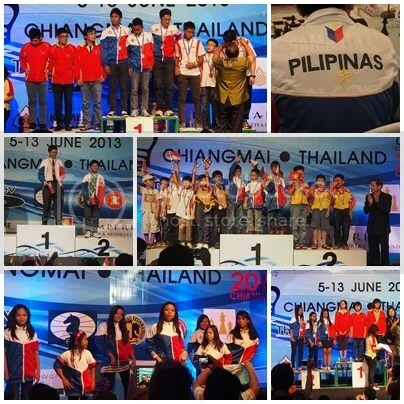 Philippines 2nd Overall in 14th ASEAN+ Age-Grp Chess Championships. The 14th ASEAN+ Age-Group Chess Championships held in the city of Chiang Mai, Thailand on 5-13 June 2013 with ImperialMaePingHotel as venue was won by Vietnam as the overall champion garnering a total of 141 medals ( 71 Gold, 31 Silver & 39 bronze). Philippines came in 2nd overall collecting 65 medals ( 24 Gold, 28 Silver & 13 Bronze). 3rd place was Singapore with 34 medals ( 10 Gold, 9 Silver & 15 bronze). We have a very simple request from our chess leaders to please restore our membership to the international chess governing body FIDE so that our country will appear in the listing of bonafide members of the chess federation.